6.1918: Launched by Hawthorns & Co Ltd, Leith (Yd.No.157)(“Strath” class) for The Admiralty as THOMAS HENRIX (Ad.No.3821). 13.8.1918: Completed as a minesweeper (1-12pdr). 2.6.1919: Loaned to US Navy (North Sea Minesweeping Detachment). 6.8.1919: Returned to The Admiralty. 1919: Registered by The Admiralty at London (Part I) as THOMAS HENRIX O.N.143887. 1919: Allocated to Ministry of Agriculture & Fisheries and engaged in commercial trawling. 1920: Allocated to the National Fishery Scheme for the setting up of the Minesweepers’ Cooperative Trawling Society Ltd, London. 08.1920: At HM Dockyard, Sheerness fitted out for fishing under Special Survey of Lloyd’s Register and classed 100A1 Stm Trawler at London. 13.08.1920: Minesweepers’ Cooperative Trawling Society Ltd, London registered. 24.08.1920: Registered by The Admiralty at London (Part IV) (LO449). 12.1921: Sold to Consolidated Steam Fishing & Ice Co (Grimsby) Ltd, Grimsby. 12.12.1921: Registered at Grimsby (GY1334). John D. Marsden designated manager. 9.1927: Owners restyled Consolidated Fisheries Ltd. Sir John D Marsden, Bart designated manager. 10.1934: Sold to James Mackie, Aberdeen (United Fish Selling Co, Aberdeen). 24.10.1934: Registered at Aberdeen (A160). James Mackie designated managing owner. 26.11.1939: Requisitioned for war service and employed on auxiliary patrol duties (P.No.4.435) (Hire rate £60.18.0d/month). 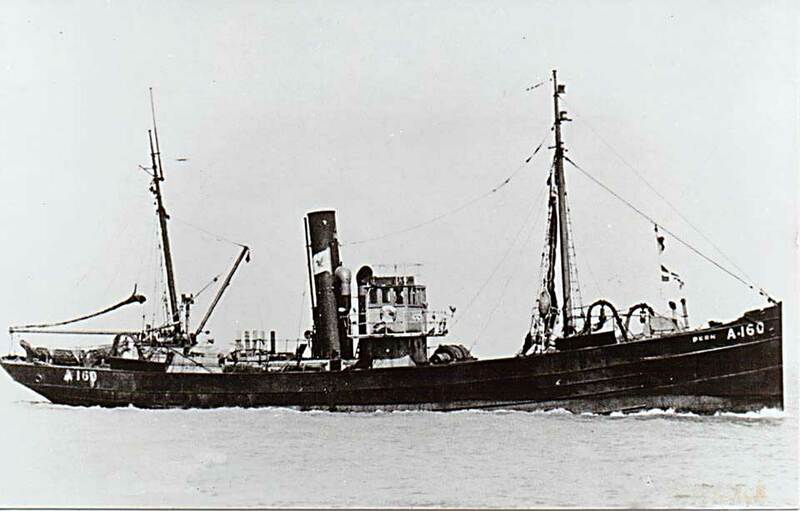 2.5.1942: Sold to The Dinas Steam Trawling Co Ltd, Fleetwood. 6.4.1944: Requisitioned for war service and fitted out as a smoke making trawler; assigned to Operation Neptune – Normandy landings. 9.6.1944: Arrived Mulberry A from Yarmouth with Group A1. Employed smoke making. 24.10.1944: Returned to owner at Fleetwood. 18.3.1946: Sold to The Brixham Trawlers Ltd, Fleetwood. Ralph S. Dugdall designated managers. 5.9.1946: Registered at Aberdeen as PERN (A160) (MoT Minute RG No.1168/46 dated 26.8.1946). 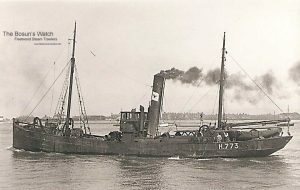 6.3.1950: In River Wyre outward for the fishing grounds in thick fog anchored off the lifeboat slipway but ebb forced her to collide broadside with IBIS (H764) already aground. Vessel took the ground and crew abandoned to beach. Refloated on next tide and returned to Wyre Dock. 7.1955: Sold to Bruges Scheepssloperij, Bruges (Jacques Bakker & Zonen) for breaking up. 19/01/2009: Page published. 6 revisions since then. This entry was posted in Steam Trawlers, Steamers (Picture) and tagged Brixham Trawlers, Dinas, Strath Class on January 19, 2009 by Fred Smith. 26.8.1903: Launched by Goole Shipbuilding & Repairing Co Ltd (Yd.No.59) for Kelsall Brothers & Beeching Ltd (64/64), Hull as KITE. 15.10.1903: Registered at Hull (H773). 15.10.1903: George Beeching, Hull & John Edmund Ambrose Kelsall, London appointed managers. 29.12.1912: In the North Sea off the Dogger Bank with the boxing fleet. With other trawlers responded following the foundering of steam trawler BRITANNIC (H447) after being run into amidships by steam trawler BUZZARD (H971). Picked up two survivors and transferred them to BUZZARD which suffered only minor damage to her fore end. 1.1.1914: Tonnage altered to 63.43 net under provision of Merchant Shipping Act 1907. 11.1914: Requisitioned for war service as a minesweeper (1-6pdr HA) (Ad.No.415). 12.1918: Returned and reverted to KITE (H773). 7.6.1919: Vessel mortgaged (64/64) to The London County Westminster & Parr’s Bank Ltd, London (A). 7.6.1919: John Slater designated manager. 28.9.1928: Robert Burton designated manager. 16.9.1932: Charles Hugh Emerson designated manager. 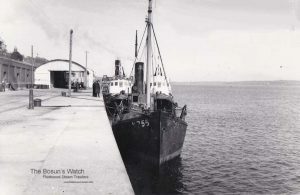 11.2.1936: Sold to Brixham Trawlers Ltd, Brixham. 14.2.1936: Vessel mortgaged (64/64) to Harold Frank Hayward, London; Maud Florence Katherine Rogers, Corfe Castle and Ernest Norton, London for £750 with interest at 5% with (joint mortgagees)(B). 1.2.1936: Ralph Stockman Dugdale designated manager. 11.2.1936: Sold to Brixham Trawlers Ltd (64/64), Brixham. 14.2.1936: Vessel mortgaged (64/64) for £750 with interest at 5% to Harold Frank Hayward, London; Maud Florence Katherine Rogers, Corfe Castle and Ernest Norton, London (Joint mortgagees)(B). 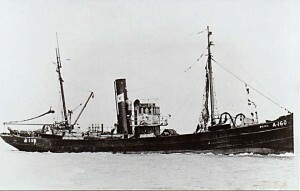 12.1937: Transferred to Fleetwood when Brixham Trawlers Ltd moved to the port. 4.12.1937: Sailed Brixham for Fleetwood in company with THRUSH (H703), fishing round. 14.12.1937: First landing at Fleetwood 56 boxes, grossed £147. 26.11.1938: Brixham Trawlers Ltd registered office transferred to Fleetwood. 2.12.1938: Ralph S. Dugdall designated manager. 13.2.1939: Vessel mortgaged (64/64) to Midland Bank Ltd, London (C). 26.7.1955: Sold to Belgian shipbreakers for breaking up. 4.8.1955: Hull registry closed “… on sale of the ship to foreigners (Belgian subjects)”. 31.7.1956: Arrived Boom from Fleetwood under own power. 17/01/2009: Page published. 4 updates since then. This entry was posted in Steam Trawlers, Steamers (Picture) and tagged Brixham Trawlers on January 17, 2009 by Fred Smith. 9.7.1903: Launched by Goole Shipbuilding & Repairing Co Ltd, Goole (Yd.No.54) for Kelsall Brothers & Beeching Ltd (64/64), Hull as AUK. 21.8.1903: Registered at Hull (H755). 8.1903: Completed (George Beeching, Hull & John E. A. Kelsall, London, managers). 1.1.1914: Tonnage altered to 63.62net under provision of Merchant Shipping Act 1907. 11.1914: Requisitioned for war service as a minesweeper (1-3pdr) (Ad.No.422). 3.1917: Fitted out to “Q” ship under names BEN NEVIS, CLAYMORE, GIRDLER, GLEN AFRIC, HOPE, LORNE, St GOTHARD and SPIKA. 30.3.1918: Reverted to minesweeping role and renamed ANTIC. 11.1918: Returned to owner at Hull and reverted to AUK (H755). 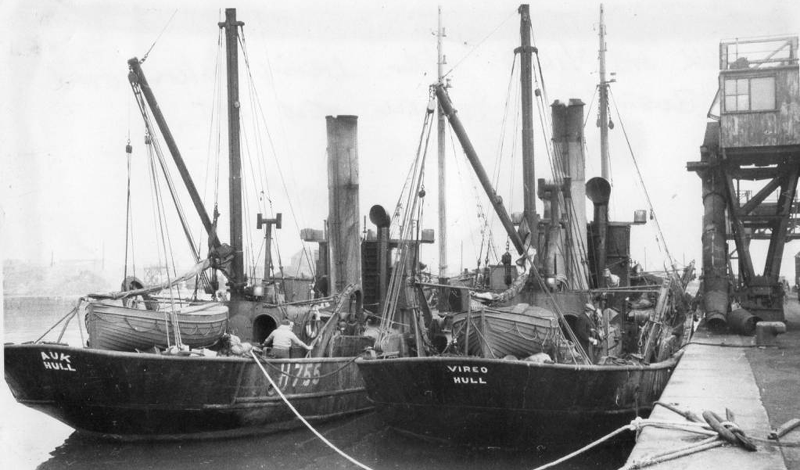 7.6.1919: Vessel mortgaged (all 64 shares) to The London County Westminster & Parr’s Bank Ltd, London (A). John Slater appointed manager. 14.2.1936: Vessel (64/64) mortgaged for £750 with interest at 5% with Harold Frank Hayward, London; Maud Florence Katherine Rogers, Corfe Castle and Ernest Norton, London (joint mortgagees)(B). Ralph S. Dugdall appointed manager. 9.12.1937: Sailed Brixham for Fleetwood in company with PINTAIL (H982). 14.12.1937: First landing at Fleetwood 8 boxes. 27.12.1937: Second landing at Fleetwood, 118 boxes grossed £250. 2.12.1938: Brixham Trawlers Ltd registered office transferred to Fleetwood. Ralph S. Dugdall appointed manager. 19.12.1945: Sailed Fleetwood for West of Scotland grounds. 31.12.1945: At Tobermory, deck hand Bernard Brooks (17) died in the fish room when a block of ice, approx 2 tons, fell on him. 1.1.1946: Called Oban to land body before sailing for Fleetwood. 26.6.1958: Gordon Cranford Dugdall appointed manager. 1.8.1959: Company taken over by Boston Deep Sea Fisheries Ltd, Fleetwood. 8.1.1960: Sir Fred Parkes, Blackpool appointed manager (Arthur J. Lewis, manager). 31.3.1960: Sold for breaking up. 15.8.1960: Hull registry closed “Vessel broken up”. 15/01/2009: Page published. 5 updates since then. This entry was posted in Steam Trawlers, Steamers (Picture) and tagged Boston DSF, Brixham Trawlers on January 15, 2009 by Fred Smith. 10.1918: Launched by Hawthorns & Co Ltd, Leith (Yd.No.163) (“Strath” class) for The Admiralty as JAMES HINES (Ad.No.3827). 1919: Sold to Benjamin Knowles, Hull. 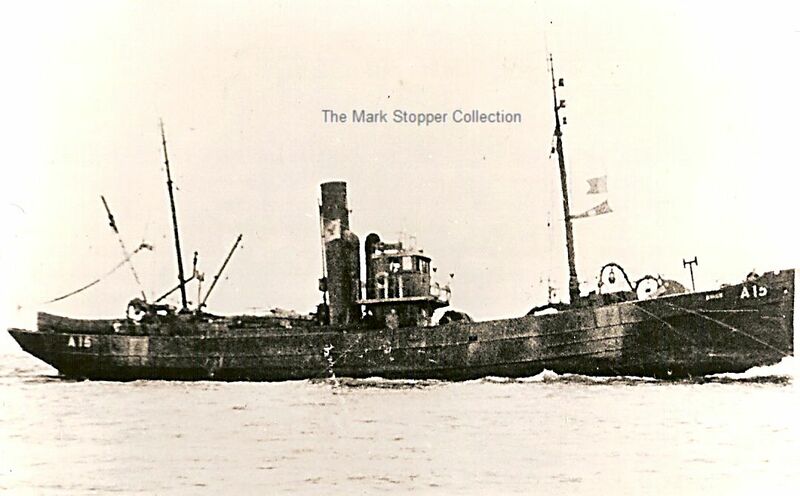 13.5.1919: Completed as a fishing vessel for The Hollinwood Steam Trawling Co Ltd, Hull (Benjamin Knowles, manager). 22.5.1919: Registered at Hull (H56). 1927: Sold to Seaward Fishing Co Ltd, Hull (Charles Hudson, manager). 13.5.1927: Registered at Hull as NORTHWARD HO (H56). 1929: Sold to Ocean Steam Fishing Co Ltd, Hull (George Altoft, manager). 3.1934: Sold to George Leiper, Aberdeen (managing owner). 3.3.1934: Registered at Aberdeen (A15). 16.7.1936: Landed at Fleetwood 248 boxes grossed £418 (Dalby Steam Fishing Co Ltd, agents). 1938: Sold to W. Leiper, Aberdeen (managing owner). 11.1939: Requisitioned for war service as a minesweeper (P.No.FY.795) (Hire rate £63.15.0d/month). 1940: Sold to Walker Steam Trawl Fishing Co Ltd & Regent Fishing Co (Aberdeen) Ltd, Aberdeen (Thomas Walker, manager). 1946: Sold to The Brixham Trawlers Ltd, Fleetwood (Ralph S. Dugdall, manager). 28.2.1946: Returned after restoration and survey at Aberdeen. 1946: Registered at Aberdeen as SMEE (A15). 7.1955: Sold to Jacques Bakker en Zonen, Bruges for breaking up. This entry was posted in Steam Trawlers, Steamers (Picture) and tagged Brixham Trawlers, Strath Class on January 7, 2009 by Fred Smith. 2.2.1904: Launched by Goole Shipbuilding & Repairing Co Ltd, Goole (Yd.No.62) for Kelsall Brothers & Beeching Ltd, Hull (George Beeching, Hull & John E. A. Kelsall, London, managers) as RUFF. 23.2.1904: Registered at Hull (H34). 22.10.1904: The Dogger Bank Incident. Flying the flag of Vice Admiral of the Gamecock fleet. Russians on passage to the Pacific in the darkness opened fire on the trawlers (approx 45 vessels) under the impression that they were about to be attacked. 2.1.1911: On North sea grounds with gale force winds and heavy seas running. Shortly before dawn saw signals of distress from a vessel some distance away. Closed and found Norwegian barque BAMSE (957grt/??) being smashed about and helpless with steam trawler SNIPE (H133) close at hand. Launched boat, manned and prepared to pull over to casualty when a heavy sea struck the barque and she capsized and foundered; none of her crew seen and presumed all lost. 1.1.1914: Tonnage altered to 63.89 net under provision of Merchant Shipping Act 1907. 11.1914: Requisitioned for war service as a minesweeper (1-6pdr) (Ad.No.676). Based Granton. 7.6.1919: Vessel mortgaged (64.64) to The London County Westminster & Parr’s Bank Ltd, London (A). John Slater appointed manager. 28.9.1928: Robert Burton appointed manager. 12.2.1929: Arrived Hull from North Sea grounds encrusted with ice; fishing abandoned. 14.2.1936: Vessel (64/64) mortgaged for £750 with interest at 5% with Harold Frank Hayward, London; Maud Florence Katherine Rogers, Corfe Castle and Ernest Norton, London (Joint mortgagees)(B). Ralph S. Dugdale appointed manager. 2.1936: Sold to Brixham Trawlers Ltd, Brixham (Ralph S. Dugdall, manager). 2.12.1937: Sailed Brixham for Fleetwood, fishing round. 13.12.1937: First landing at Fleetwood, 104 boxes grossed £220. 13.2.1939: Vessel mortgaged to Midland Bank Ltd, London (C). 28.7.1955: Sold to BISCO and allocated to Thos. W. Ward Ltd, Sheffield for breaking up at Fleetwood. This entry was posted in Steam Trawlers and tagged Brixham Trawlers on January 4, 2009 by Fred Smith.